Gather outside on the new 7-piece Modular Sofa Sectional offering superior style, quality and value in outdoor living. Personalize your space by arranging the components as a wrap-around U and create comfortable conversation space for your guests, or rearrange the lightweight components to fit your personal needs. 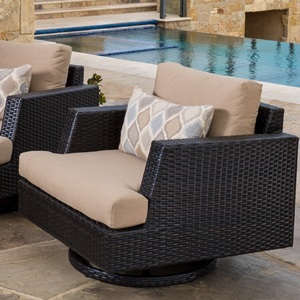 Sink into true deep seating with plush 6-inch thick Sunbrella wrapped cushions and accent toss pillows with rich contrast piping. New stone top veneer conversation table provides plenty of space for refreshments and libations to entertain your guests. Set includes two 48-inch sofa ends, two corner chairs, two armless chairs, and a stone top coffee table. High density, quick drying foam cushions in Sunbrella® fabric ensure comfort and convenience. Cushions feature breathable mesh bottom with integrated Velcro® strap system to hold cushions securely in place.